This is a very old fashioned recipe of Kerala.This is also called " koozu kachina dosai". it takes time to master this art of making neer dosa. Neer Dosa is a special kind of dosa from Karnataka (Dakshina Kannada) prepared from rice. Neer in Kannada means ‘Water’. 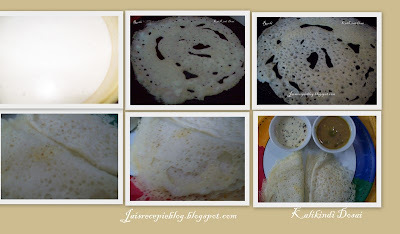 Neer dosa is prepared by grinding soaked rice into a thin watery batter and then made into pancakes (thin) on hot griddle. Neer dosa is very easy to prepare as you can make it without much planning and is easy to make and tasty too. The best part is this dosa does not require any fermentation. This dosa comes out lacy thin and white. 1.Soak both rice together & grind vey fine adding coconut & salt. 2.Take 1 cup of the paste, mix with more than 2 cup of water & cook stirring to prevent lump formation, to get a porridge.This is called “ kali”.Cool it thoroughly & mix with the remaining batter. 3.The batter should be very liquid almost in water consistency. 5.Once cooked, carefully remove from tawa and serve hot with coconut chutney or tomato chutney or with brinjal gothsu. I too like easy and no fermentation required dosas.Looks good. Kali kindina dosa is a nice idea for quick dinner. Love this dish very much. Good one... will give a try! Wow this looks really a quick breakfast or dinner..will try! wow.. great dosa.. looks really delicious..
பார்க்கும் பொழுதே மிகவும் சுவையாக இருக்கும் போல தெரியுது..
so yummy...thanks for the recipe. Lovely! i love the laces on dosa..looks perfect! yep.. its a famous one in our house too.. I too hav heard a lot abt this,will come out too soft! !